Custom sized replacement sliding screen door made with our strong traditional profile frame. 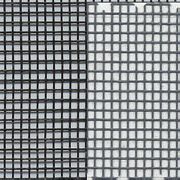 Fiberglass insect Screen Mesh is fade proof, rust proof and dent proof. Replace worn and broken sliding screen door rails. Replacement vinyl bug strip for sliding screen doors.